These beautiful long large flowered natural Roses are sprayed with artificial snow to give a winter effect. These snowy Roses are available in different colors. You can decide for yourself the number of Roses that you want to order by entering the number in the box for the shopping cart, however the minimum number of Roses that you can order is 10 Roses. On the basis of the number of Roses ordered by you, a Rose bouquet is made by hand so that you or the person who receives the roses will receive a beautiful Rose bouquet. The indicated price is the price for 1 long large flowered Rose with a length of 70 cm. You can add a flower gift card to the Rose bouquet, by clicking on the button Add a Flower Gift Card and check the box of the desired flower card (the flower cards can also be viewed on the page flowers cards). The price of the flower card is mentioned below the flower card. You can fill in the personal message that you want to be printed on the flower card in the text box. Of course you can skip this option by not selecting a flower card. You can also choose the sleeve for the Rose bouquet by clicking on the button Select the Bouquet Sleeve, where you can choose the bouquet sleeve by ckecking the box of the desired sleeve. You can also add a nice romantic hug to the Rose bouquet by clicking on Add a Romantic Hug by selecting one of the hugs. Then click on the shopping cart and the Rose bouquet has been placed in order. title to its worldwide popularity. Roses are always welcome and are suitable for any occasion. and with long or short stems and each year a few beautiful new varieties are added to the range. with Roses and red Roses are definitely the symbol of love. Did you know that each colour of the Rose has its own meaning? love are not always a bed of Roses and symbolizes the effort someone is prepared to go to for their loved one. These long Roses with big heads are grown by Dutch growers. 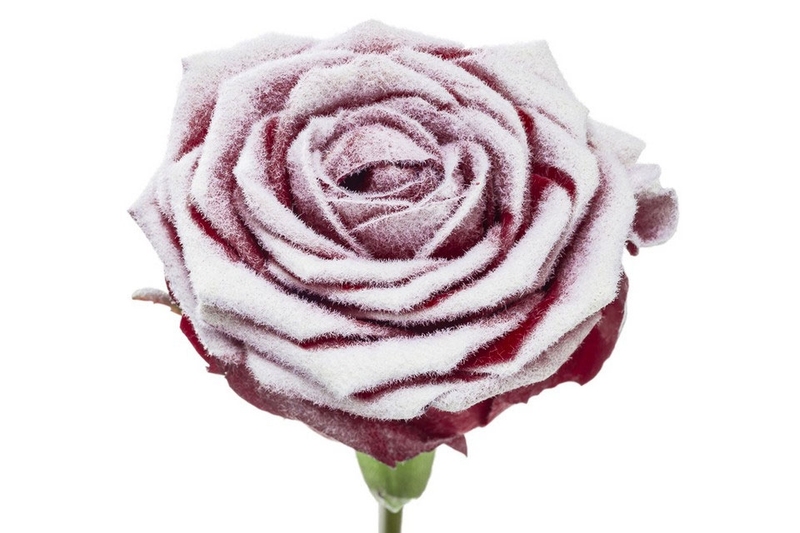 This beautiful large flowered long Roses are sprayed with a snow layer. - Cut the stems off diagonally at the end. Use a sharp knife for this. wounds which are prone to bacteria. - Give Roses a clean vase with clean water. or near the fruit bowl. Beautiful Roses with a colored blush.